Defining Wellness: Hettler's Six Dimensions. Live Well. Summary of Hettler's Model: Hettler's model focuses on an integrated approach to, what I would call a healthy and happy life, aka wellness. Many of us may casually analyze ones 'health' by two components: diet and exercise. 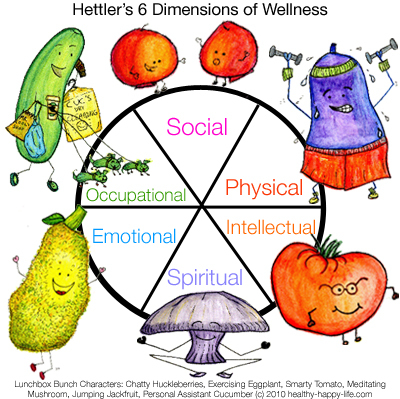 But as you can see by Hettler's model, wellness is defined by six equal areas of your life: physical, emotional, intellectual, spiritual, social and occupational. Achieving wellness is about finding balance in these six key areas. Yes, the "physical" part of wellness is an important piece of the pie, but it does not dominate the chart (even though diet and exercise get the most 'press' in today's media). Working out at the gym and eating right does not result in wellness - it is simply one part of the puzzle. All six "wellness pieces" are equally important. Here are my quickie key points of the six dimensions. Following the 'quickies' are more thorough definitions. A Closer Look. Now lets look at these six areas more closely. I have used my own voice to interpret the basic theories of Hettler. Any direct quotes are clearly marked. Physical. Physical wellness focuses on the state of your physical body. It also focuses on how you treat your body and react to its fluctuations in health. *Maintain proper nutrition, and understand its relationship to the functions of your body. *Engage in adequate physical exercise to achieve strength, endurance and flexibility. *Ability to monitor the state of your body (vital signs) and react to minor and major illnesses. *Acknowledge that your body is in an ever-changing state - never static. Emotional. Emotional wellness is achieved when a person is aware of, and accepts a wide array of emotions and feelings. An emotionally well person also realizes that 'happiness' is not the only desired emotion in life. Growth and emotional maturity develop when one experiences and accepts a wide variety of emotions: happiness, anger, sadness, determination, frustration and many more. *Ability to manage and assess feelings and emotions effectively. *Ability to make decisions which have been influenced by the evaluation of current emotions. Occupational. Occupational wellness is achieved when a person uses his/her skills effectively in a paid or unpaid setting to contribute to the community while experiencing personal fulfillment and satisfaction. *Contribute your skills to a community. *Experience fulfillment. Satisfaction in applying your skills to the world. *Find a satisfying balance between financial fulfillment and personal accomplishment and happiness in the work you choose to do. Spiritual. Spiritual wellness focuses on that 'big picture' view of life. A spiritually well person can accept and appreciate that which is not completely understood. They also seek to question the meaning and purpose of life for themselves and those around them. Spiritual wellness does not specify a religion, it is simply a state of questioning the universe and desiring to understand and define universal values in the world. *Question your personal values and how they interact with the world. Universal values. *Question the purpose of life and seek to find meaning in both your everyday and 'big picture' existence. Intellectual. Defined by Hettler as, "Intellectual wellness is evidenced by self-directed behavior, which includes continuous acquisition, development, creative application, and articulation of critical thinking and expressive/intuitive skills and abilities focused on the achievement of a more satisfying existence. Intellectual wellness is also evidenced by a demonstrated commitment to life long learning." In other words, engage your mind daily and challenge it. Engage in activities that allow you to analyze, create and contemplate. Intellectual wellness should be treated like physical wellness in that you must actively commit yourself to a routine of challenges and activities. Instead of engaging your muscles, you are engaging and challenging your mind. *Get creative. Art, writing, acting, designing and crafting (and cooking!) are all great ways to engage your mind. *Use critical thinking to improve your life. *Challenge and commit. Challenge your mind daily and commit to a lifetime of continued learning. *Treat your mind as the most important 'muscle' in your body. Get a buff mind! Social. Social wellness is closely connected to emotional wellness. You need one to achieve the other. It is difficult to achieve emotional wellness if your social wellness is lacking. And vice versa. Social wellness involves your relationships to individuals, groups and communities. *Contribute to the common welfare of the community. *Seek and maintain a mutual respect with the people in your life. *Contribute to the wellness of your community by encouraging and motivating others to engage in healthy lifestyle habits and activities. *Maintain emotionally and physically satisfying relationships.